At a recent morning bike event, a company was handing out sample packets of savory oatmeal concoctions — oats combined with dehydrated vegetables, cheese, sausage and such. “Scrambled Oats” is one of those easy-to-pack foods that might taste great on a cold morning while backpacking, but seems a lot less appealing at home. However, it got me thinking. Instead of just using oatmeal for breakfast , how about using oatmeal to solve (or at least lessen the impact of) health and household problems? Here are 15 problems that can be tackled with oatmeal. 1. Acne: If you are a acne-addled teenager and you’d rather eat a Pop-Tart, don’t toss out the oatmeal mom tries to make you eat for breakfast. Instead, let it cool, then spread it over your problem skin. Let sit for about 15 minutes, then rinse. This folk remedy is based on sound logic, according to the Livestrong Foundation. Oatmeal can absorb and remove oil and bacteria, and exfoliates dead skin cells, all of which can combat acne. Honey and tea tree oil are helpful additives. 2. Poison ivy or chicken pox: If poison ivy, chicken pox or even a sunburn has you itching like crazy, try an oatmeal bath. The Old Farmer’s Almanac has these directions: Grind oats or oat flour into a fine powder, then pour it into cheesecloth or an old (clean) piece of pantyhose. Knot it around the bathtub faucet and draw a tepid bath, periodically squeezing the water into the tub. You can also rub the pouch straight on the itchy skin. 3. General skin problems: You can also make oatmeal soap or scrub (and, of course, pricey commercial oatmeal skin products are also available) for tackling other skin problems. One option is to grind two tablespoons of oatmeal to powder in a blender. Then add one teaspoon of baking soda and enough water to make a thick paste. Spread on a clean, dry face and rinse off after 10 minutes. We recommend doing a patch test first, as your skin could be sensitive to the baking soda. 4. Exhaustion: Oatmeal isn’t just good for ailing skin. It's possible to make a soothing and rejuvenating facial mask right in your own kitchen. The Reader’s Digest book “Extraordinary Uses for Ordinary Things” offers the following recipe: Mix 1/2 cup hot water with 1/3 cup oatmeal for two or three minutes, then add two tablespoons each plain yogurt and honey, plus one egg white. Spread thinly on the face, then relax for 10 minutes and rinse with warm water. 5. Stress: You don’t need to get chicken pox to have an excuse for a soothing oatmeal bath. The Daily Green suggests adding a cup of milk, two cups of oats and a tablespoon of honey to the bath to moisturize the skin and relax the body. TIP: Put the oats into a pouch before placing in your tub or you may need to find a plumber to unclog the drain. 6. Dirty hair: Oatmeal can cleanse hair as well as skin. The Livestrong Foundation recommends making an oatmeal-based dry shampoo, ideal for bedridden patients or anyone running too late for a proper shower. Again, commercial options are available, but the homemade version costs pennies. Just grind oatmeal into a powder and mix with an equal amount of baking soda. Rub into the hair and let it soak up oils and odors, then brush out. 7. Itchy, uncomfortable dogs: Dogs also suffer from skin and hair problems, so why not share your oatmeal miracle cures with Fido? Small Dogs Paradise, a holistic canine care site, suggests mixing equal parts oats and warm water and rubbing the mixture thinly over a dog’s dry, itchy spots. Wrap in aluminum foil and keep the dog still for 10 minutes. Rinse with lukewarm water and repeat regularly until your dog is scratching less. 8. Excess weight: Health magazine says there is nutritional science behind that feeling of satiation after a bowl of oatmeal. Oat flour has more fiber than wheat and other flours, so cooking with oat flour will deliver more “fullness” with fewer calories. 9. Low endurance: Studies have shown that oats can help fuel muscles during a workout. So eat some oatmeal about three hours before your next run or bike ride and enjoy the time-release benefits of this fiber-rich complex carbohydrate. 10. Preventative medicine: To be sure, we’re not suggesting oatmeal is the cure for cancer. However, a study in the International Journal of Epidemiology suggested that premenopausal women can reduce their risk of breast cancer up to 41 percent by focusing on diets rich in oatmeal and other whole grains. 11. Thicken soups, stews and dips: Runny dips are not exactly a health crisis, but they can be a party foul. Solve the problem by mixing in some ground oats or oat flour. 12. Fix crumbling meatloaf or veggie burgers: Similarly, oats are a healthier and heartier alternative to bread crumbs for binding burgers, meatloaf, meatballs and more. 13. 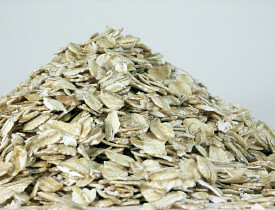 Stinky fridge: Similarly to how it absorbs skin oils and hair odors, oatmeal can absorb odors in fridges or bathrooms. Just leave an open container of oats in the fridge or other smelly spot. 14. Smelly ashtrays: Another odor-neutralizing trick is to line ashtrays with oats and absorb some cigarette smells. 15. Bored children: Finally, anyone who has left oatmeal in a bowl overnight can attest that it becomes hard and crusty, not unlike clay. CafeMom, a parenting forum, recommends mixing two parts oatmeal with one part each flour and water, and a few drops of food coloring, if desired. The resulting Play-Doh substitute may be molded into virtually any shape, and painted once dry. Steve Graham writes for networx.com.